This message, and any attached documents, may include proprietary or protected information. If you are not the intended recipient, please notify me, delete this message, and do not further communicate the information contained herein without my express written consent. Some very bad, intentional, misinformation is being circulated today by email and on Facebook, about how the city manages it's savings accounts, otherwise known as reserves. "Reserves" are a fancy name for savings accounts and the city maintains 12 different ones. Each has a different purpose but I'll get to that below. In my view, the information being circulated is a very intentional twisting of the facts - maybe not quite a lie, but certainly "intellectually dishonest". I'm sad to read some of the people lending their name to it. In the email version of this, one part says: "In 2011, $31 million was placed in unrestricted reserves because the city charged you more in taxes than they spent." The email goes on to suggest that the city should use the money that went into those reserves instead to lower taxes. So basically what it's saying is if we dumped out all our savings accounts (or didn't add to them) taxes could have been lower which is true - it's just very, very stupid. At the most basic level it's good financial management to put money away for things that you know you'll need down the road or to help out with unexpected financial expenses. This is what the city does with reserves. If that all makes sense to you then you can see how this info is twisting the facts and I'd encourage you to share this note with your friends using the share button below, or by copying and pasting this note in to an email to your friends. Don't feel you need to read any further. Below I'm going to give you some examples about the details of what our reserves are - because I believe you deserve to have actual facts. Every year the city makes planned transfers to our reserves (deposits into our savings accounts.) Each one of these savings accounts has a policy that says exactly what it is intended to be spent on and in most cases how we will decide to add money to it. These policies are all publicly available on the city's website here: http://www.cityofgp.com/index.aspx?page=786 Look at them for yourself. An example of one of these "savings accounts" is the Cemetery Perpetual Care Reserve. • It's purpose is "to provide for the improvement, maintenance, management, control and operation of City cemeteries." The expenditure guidelines state that the reserve is to be used "or the upkeep of the cemetery once it has been closed for future interments." So yes, if we followed the suggestion in the email we could use that to lower your taxes next year but then there'd be no money to make sure the cemetery is cared for in to the future! We could also drain the Winter Stabilization Reserve. • It's there to "offset over-expenditures that may occur in the snow removal and ice control operating budget as a result of abnormal winter conditions." Of course if we did that and then had a big snow fall year this year we wouldn't have any money to call in additional contracted equipment or pay for overtime to keep staff on the road. What do you think? Maybe a good idea to have that savings account set up? We could clean out the Financial Stabilization Reserve. • It's really our "if things get bad" fund - there to manage "any annual operating deficiencies." This is essentially a buffer for the city should we have an unexpected loss of revenue for any reason. It IS used to shelter you from big tax increases when unexpected things happen. For example we have used this fund this term to make up for losses of revenue that we had budgeted for. Specifically when the County ended their contract for fire services with the city and when Aquatera moved out of city hall and stopped paying rent. In 2011 those two items together took away $4 Million in revenue we were expecting but you didn't see it drive up taxes, or force us to chop services in a knee-jerk fashion - because we were able to draw on the reserve. I could go on but I think you get the point. Anyone telling you that the city should drain it's reserves to keep your taxes low is hoping that you won't think for yourself. Really the whole thing is shameful. Last night council formally approved moving the annexation process forward by approving a final set of information sessions for the public. 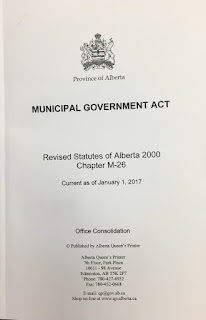 As the City's media release below details it's been a long process to get to this point, and there is still more to go before annexation is actually complete. Although the City "officially" initiated annexation back in early 2011 (by sending the County and the Municipal Government Board formal letters) I really view the process as having started back in 2005 or 2006. Back then Mayor Ayling's council started a discussion about how the city would grow in the future and that initiated what would result in the 2008 Growth Study (PDF Download). 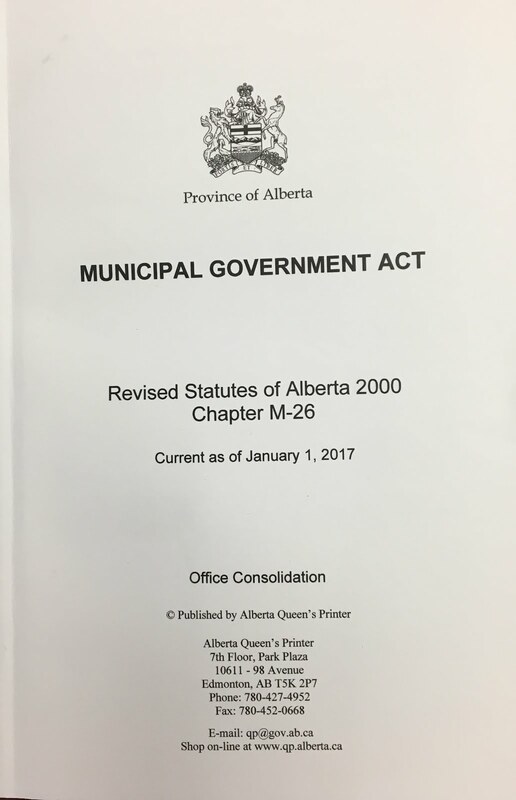 Then, after the election in 2007, Mayor Logan's Council started renegotiating the Intermunicipal Development Plan (PDF Download) with the County. When it was completed, after nearly 3 years of negotiations, the IDP laid out the future annexation areas for the city in two chunks that were intended to provide for a "30 Year" and "50 Year" growth horizon. Then, shortly after the 2010 election - in the spring of 2011 - this current council sent the letter that started the direct negotiations and landowner consultations that we are just wrapping up now. Future growth areas for the City. Once the annexation is complete the city still has a lot of work to do to encourage growth and development of new tax paying properties in the new areas of the city. City Council recognizes this and we've started that work by recently adopting our Industrial Attraction Strategy (LINK), and beginning investments in the infrastructure that will help fuel development. So, we are nearing the end of one phase of what has been, and will be, a very long process in improving the City's financial viability. 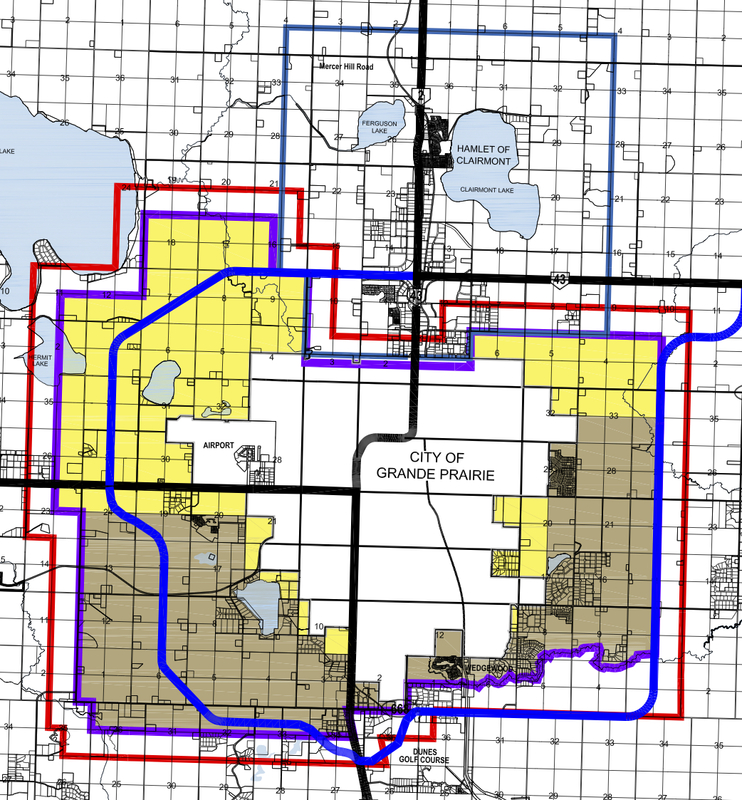 City Council Monday approved two open houses for County of Grande Prairie residents to meet with Councillors and Administration regarding the City’s annexation application. These final information sessions are set for May 27 and 28 at the Muskoseepi Park Pavilion from 4:30 p.m. to 8 p.m.
“These open houses and the mediated sessions that preceded them are part of the application process to the Municipal Government Board (MGB),” says Senior Planner Stuart Wraight. The City has focused on landowner transition provisions as its priority while keeping in mind relevant previous MGB decisions. An application will proceed by June 30. The Board will review the submission and then schedule a public hearing in Grande Prairie to consider the City’s request and to obtain information from residents and landowners who wish to make presentations. If successful, the City would request that annexation become effective on Jan. 1, 2015. City and County administrations began discussing annexation terms in November 2011. Council to council negotiations began in August of 2012 and had several meetings through to December prior to mediation this spring. Prior to negotiations with the County, landowners within the proposed annexation area received information packages from the City dealing with items such as proposed taxation and service levels, lifestyle and leisure issues as well as planning and development opportunities. The City’s Planning Department held open houses and provided consultation opportunities for land owners. Annexation would give the City about 6,300 hectares in the west and northwest, northeast and several quarter sections surrounding the City. 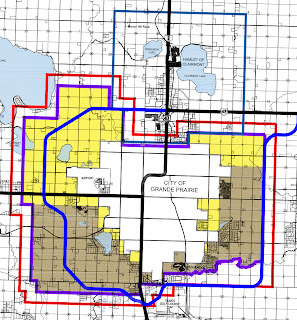 The City and County of Grande Prairie agreed on the lands to be annexed through adoption of the Intermunicipal Development Plan in June 2010. The Legion Track resurfacing project is well underway! The Facility Maintenance Department is landscaping the interior perimeter of the track to address drainage issues, repairing irrigation lines as needed, removing the old rubber crumb track surface and installing the new track surface. We may have the opportunity to install the new long jump pits as well, but this depends heavily on our strict time frame. Work will continue for approximately 5 – 6 weeks. During this time, access to the track is limited to construction workers and City employees wearing safety vests. There will be one Drillers football game as scheduled on July 7th . Once the project is complete, vehicles will no longer be allowed on the track for any reason. When crossing the track with mowers, light trucks, tractors etc.. rubber mats will be available to place across the track surface. Any and all vehicles including City vehicles will need to stay on the gravel path on the south side of the track or travel in the grass areas on the exterior perimeter of the track. Please ensure that summer staff without email access are aware of these changes. Feel free to forward this email to affected user groups throughout the City of Grande Prairie. Thank you for your patience over the next few weeks. The demographic breakdown of our area from the 2011 census was released recently by StatsCan. 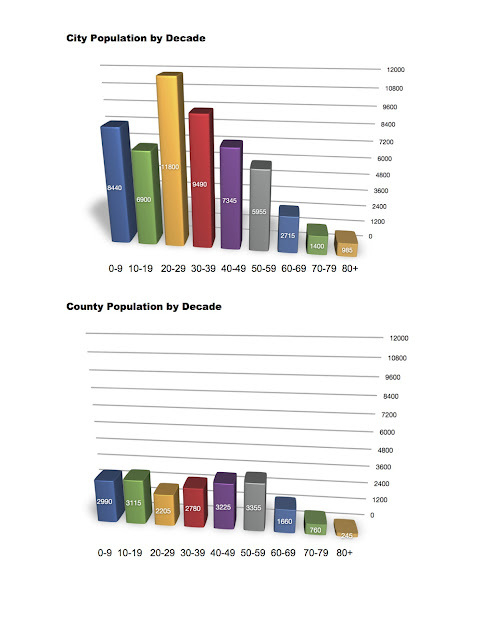 The attached charts show how the city and county populations break down by age. Both graphs are on the same scale to make comparison easier. Some interesting ways I found to look at the data…. • The City has more people under the age of 20 (15340) than the County has over the age of 20 (14230). That is to say that our population of school aged residents is larger than the whole adult population of the County. • The City's median age has risen slightly to 30.3. (the County's median age is 36.8), which is still MUCH younger than Canada as a whole (40.6). • Grande Prairie can legitimately lay claim to being the YOUNGEST city in the province. • Grande Prairie is also the YOUNGEST city in Canada over 10,000 in population. If you include cities under 10,000, we are the fourth youngest behind only Lloydminster (the Saskatchewan side only), Martensville, SK and Iqaluit, NU. The skewing of our city's population obviously leads to some unique challenges (we're going to need more schools for sure - especially a the elementary level) but I believe it also is one of the reasons our city is so dynamic and active. Now how's THIS for entertainment at the Crystal Centre? GRANDE PRAIRIE, AB – Elton John will perform solo at Crystal Centre on Thursday, April 26th at 8PM performing his “Greatest Hits Live” concert, featuring number one chart hits and classic album tracks from throughout his incredible five-decade career. This will be Elton’s first ever appearance in Grande Prairie. The public on-sale will begin Friday, February 10th at 10 AM. One of the most successful live acts on the road today, Elton puts on the kind of concert you will never forget: the entire audience standing, dancing and singing along with much-loved classic songs such as “Your Song”, “Rocket Man”, “Bennie and the Jets”, “Philadelphia Freedom”, “Crocodile Rock”, “Don’t Let the Sun Go Down on Me”, and many more. "It's a thrill to be able to welcome a star of Sir Elton John's stature to Grande Prairie. His legendary performances have entertained millions worldwide and seeing him live at the Crystal Centre is truly a once in a lifetime opportunity," said Grande Prairie Mayor, Bill Given. The monumental career of international singer/songwriter and performer Elton John spans five decades. He is one of the top-selling solo artists of all time, with 35 gold and 25 platinum albums, 29 consecutive Top 40 hits, and he has sold more than 250 million records worldwide. John holds the record for the biggest selling single of all time, “Candle in the Wind ’97,” which sold over 33 million copies. Since his career began in 1969 he has played over 3,000 concerts worldwide. Tickets are $91.50, $151.50 and will be available online at crystalcentre.com, at the Crystal Centre box office or charge-by-phone at (780) 538-0387. A service charge is added to each ticket. There is an 8 ticket limit per customer. At tonight's council meeting one of the agenda items will be the third and final reading of the proposed changes to the sections of the city's business licence bylaw that deal with regulations around taxis. The discussion about the changes has been covered in the media many times - and most of the time the media focus in on the proposed "cap" on the number of taxis that the city would licence to operate. As of right now the "cap" has been stripped out of the bylaw. That happened at our last council meeting when a number of council members objected to it and a motion was made to pass the bylaw with out that section. If the bylaw passes "as is" tonight then we will have no cap on the number of taxi licences that the city will issue. Much of the attention during the debate has been on how this is "government interfering with the free market". Unfortunately I think that point of view fails to take into account why the cap was proposed in the first place - it provides us a lever which we can use to encourage the taxi industry to provide better service ... specifically to people with mobility issues. The bylaw stated that we would limit the number of taxi licenses to 173 and review that number every two years to see if it needed to be adjusted. The bylaw also made allowances for drivers who operated in 2010 but missed the registration deadline due to personal circumstances - they were allowed to reregister and that brought the number of registered taxis to about 206... already well above the "cap". The thing about "The Cap" is that it does not prevent new taxis from coming on the the road. Anyone could licence a new taxis - IF it was either wheelchair accessible OR a hybrid. I will be the first to admit that there is no question that this would be an example of government regulating of private enterprise. But the truth is that we already regulate the taxi industry in many ways and I feel this is a reasonable way for us to encourage the industry to begin providing service to a good portion of our population who have very few options for transportation. I also think it's kind of like saying we welcome new businesses BUT you have to provide a handicap stall in your parking lot - not an unreasonable request. The funny thing is that much of the taxi industry is in SUPPORT of the cap. The cap would provide a financial incentive for private business to invest in bringing wheelchair accessible taxis to the city. Basically we are saying that we have enough old police cars out on the streets and that if you want to bring a new unit to the city to do business it should be wheelchair accessible (or a hybrid). So tonight council will debate the third and final reading of the taxi bylaw... without the cap. If no changes are made and the bylaw is passed as is we will loose that lever, that incentive, that the cap provided to encourage taxi operators to bring wheelchair accessible taxis to the city. It makes me think of how we managed to get the last accessible taxi on the street (pics)- by giving a $20,000 grant to do it. If we had had a cap in place at the time maybe the city wouldn't have had to do that. I think it's telling that there have been no new accessible taxis since the city last contributed money to make it happen ... unless there's some kind of financial incentive then industry won't do it.